Whether you’re planning a wedding reception, corporate meeting, birthday, anniversary, retirement, graduation or holiday party, you can underscore the special in your upcoming event by selecting an ethnic food as your catered selection. You literally have a world of ethnic catered foods from which to choose, serve … and delight! If considering European cuisine for events, imagine a menu featuring French, Greek, Italian dishes, a Spanish paella or even a German Octoberfest theme. If seeking Asian foods for catered events, you might want to consider Chinese, Indian, Thai and Vietnamese choices. Japanese is often a hit, and don’t overlook whole roast pig – a delicious and impressive Filipino specialty! 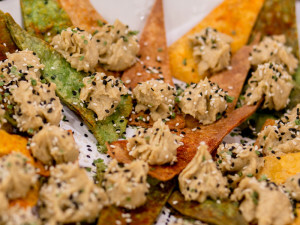 Hummus and Pita Chips are a popular middle eastern option for catering. Of course, Africa and the Middle East also offer global fare for weddings and special events. You’ll add to the flavor of your occasion with Ethiopian or Mediterranean cuisine, perhaps including Lebanese shish kebabs. Closer to home, your selection in catered ethnic foods could feature Caribbean dishes or Mexican tacos, burritos and enchiladas. Cajun dishes are popular, a Hawaiian luau is impressive, and few choices accent a picnic or outdoor party like Southern Barbecue! Worried that certain guests might prefer one international special event cuisine and not another? Given the popularity in ethnic foods across America you shouldn’t be, but one way to address this concern is with a buffet or food stations. Offering different ethnic food selections at your event will give your guests multiple opportunities to select, sample and enjoy. Bon appetit!